While outsourcing to a foreign manufacturer might seem like a cost effective solution, going with a foreign supplier is not without peril. Not all foreign suppliers adhere to the necessary standards and practices involved with manufacturing. Additionally, issues with quality control, material quality and difficulty of communication can create problems and issues that can affect the overall production and delivery of the product. When looking for a foreign manufacturer for your product, remember a foreign manufacturer is under no obligation to put you, the customer, first. As experience has shown, in the 2007 and subsequent Mattel toy recalls, quality of materials is not always in place with foreign manufacturing. In many cases, foreign manufacturers rely on a volume business model that dictates using lesser quality materials for a higher return. This can contrast directly with other companies who use the quality assurance/customer first business model. While some foreign manufacturers will express a willingness to partner to develop a quality solution, many are only concerned about their needs and not that of their customer. Everything previously mentioned about material quality can also be applied to quality control methodologies and practices in some foreign manufacturers. Minor defects in manufacturing are ignored as it is not recognized as a potential failure point during long term use. Other issues related to quality control is improper training, lack of effective quality communication and a lack of understanding towards customer expectations and needs. All of which has a negative effect on quality control in many foreign manufacturers. Often this is due to a cultural difference and not a willingness on the manufacturer to produce defective parts. 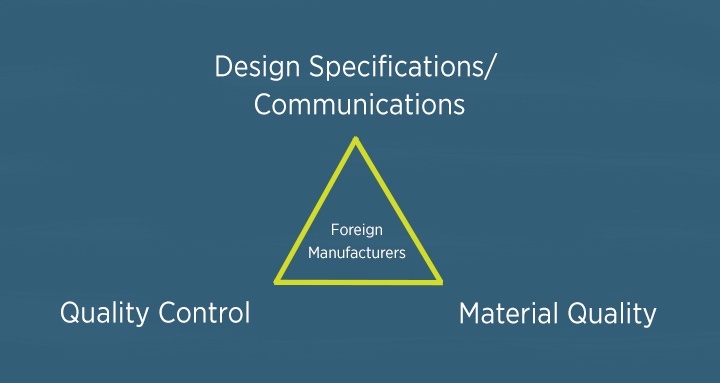 Design specifications produced in one country and required in another for actual production or manufacturer can be inhibited by the communication barrier. While attempts are commonly made to address any communication difficulty, on critical components subtle differences can occur in the different meanings of words. This can lead to manufacturing problems, delays and even defective parts that can compromise the overall project. While working with a foreign manufacturer might be cost effective in the short term, long term it is more efficient and effective to go with a domestic supplier or manufacturer when possible. The per unit cost might be higher but what is gained in quality, lack of cultural differences and communication differences, low delivery costs, better inventory programs (compound over bulk) is better for your company.